I'm a big fan of sports talk in general and 790 The Ticket in particular. I also enjoy listening to the Hochman & Zaslow Show every morning from 6-10 a.m every weekday. That's a show that continues to improve as their chemistry grows. 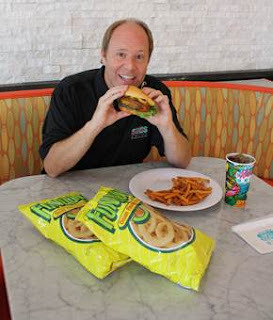 If you listen to the show regularly, you know that Hochman is a big food fan and loves to talk about it on the air. Thus, as a fan of the show, I was honored when Hochman asked me to be a guest on the show and talk food with them. If you missed my appearances when they aired you can hear them again HERE and HERE. The “Hochman Burger” starts with two fresh angus steak patties topped with chipotle BBQ sauce, cheddar cheese, lettuce, tomato and crowned with Hochman’s favorite crispy onion-flavored corn snack, Funyuns ®. 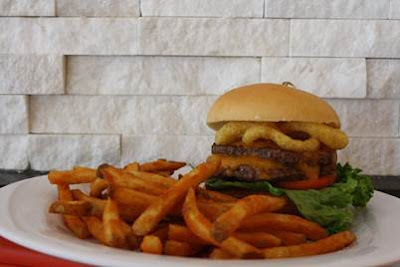 The “Hochman Burger” will take its place among The New Miami Subs Grill’s fresh angus steak burgers including “Nacho Ordinary Burger,” “Big Havana,” and the “Bistro Burger,” recently voted Top Ten Burgers in South Florida by a reader contest held by WPLG Local 10. For a limited time, a portion of the proceeds from the sales of the “Hochman Burger” will be donated to the Irie Foundation, founded by Miami powerhouse DJ Irie, the official DJ for the Miami Heat. From July 29 to August 30, guests can purchase the “Hochman Burger” at any The New Miami Subs Grill for $5.29. Irie Foundation seeks to empower South Florida’s at-risk youth to lead productive lives through mentorship programs, cultural experiences and scholarship opportunities. By following the young people it serves from middle school through high school, the foundation’s ultimate goal is to inspire and encourage its students to graduate high school, pursue higher education and develop into successful adults. For more information, visit IrieFoundation.org. I'm a food fan, I'm a burger fan, I'm a Hochman fan and I'm a charity fan. Please go and support this great cause.